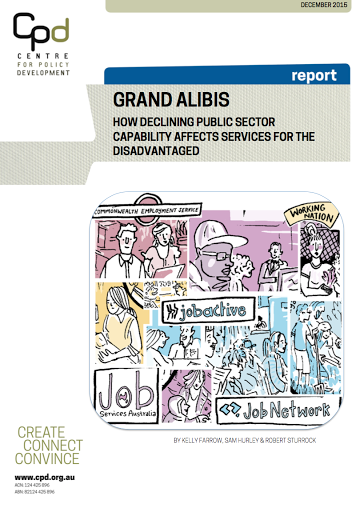 CPD has released a new report called Grand alibis: how declining public sector capability affects services for the disadvantaged. In the report, authors Kelly Farrow, Robert Sturrock and Sam Hurley argue that government’s role in designing and delivering integrated, flexible and holistic human services is more important than ever, but that the capabilities it needs to do so are under threat. Grand Alibis is built around one key question: has contracting out services improved the public sector’s capability to address persistent disadvantage and meet complex needs? It argues that outsourcing has eroded the experience, skills and policy toolkits that the public sector needs to develop the best policy responses – whether these are deployed publicly, privately or as part of mixed models. The report examines Australia’s outsourced employment services system as a case study. Despite continued efforts to improve outcomes for the most disadvantaged jobseekers, better results remain elusive. As with other key services, designing and delivering more effective employment services is a formidable and complex task. There are no easy answers or off-the-shelf solutions. But the report argues that some consequences of the current model, such as barriers to collaboration and flexibility, make delivering well-funded, integrated and responsive services even more difficult than it needs to be. 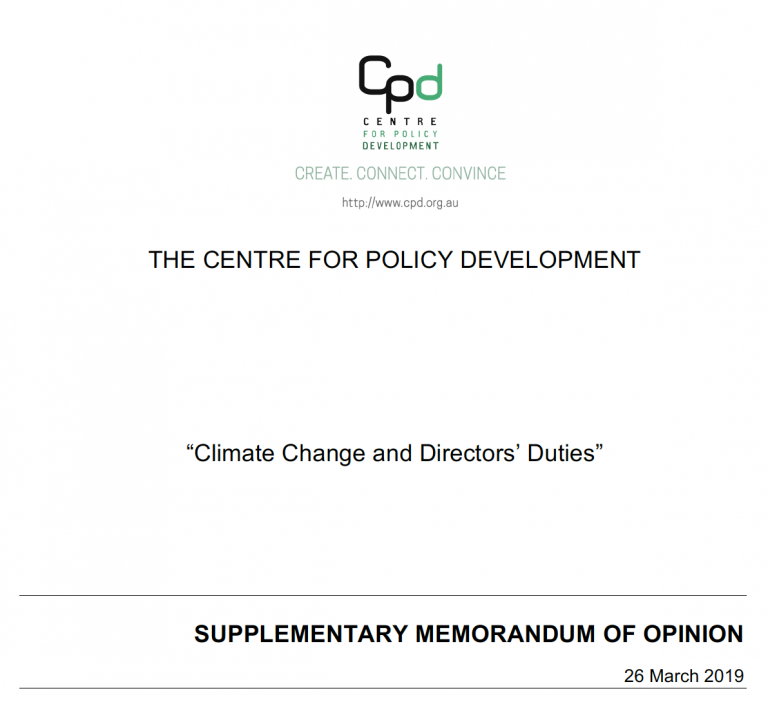 The disconnection between policy makers in government and the experience, expertise and capabilities needed to develop and deploy better alternatives makes the challenge even greater. Grand Alibis argues that blurred responsibility for underperforming services means that no one organisation is held accountable when these problems become entrenched. But while government can temporarily avoid blame, its fundamental long-term accountability for advancing wellbeing and addressing disadvantage means it cannot afford to lose the capabilities needed for these tasks. The report says it is time for a strengthened, ongoing and transparent framework for making decisions about how to design and deliver effective government services – especially in cases of complex, entrenched disadvantage. Following the Harper Review, reforms to increase choice and contestability in human services must acknowledge and protect the public sector capability needed for government to play a range of design, commissioning and delivery roles in an increasingly complex human services landscape. Build public sector capability by resourcing government departments to act as effective, persistent policy entrepreneurs, including by trialling different service models, with the skills and staff to develop the evidence and analytics base on an ongoing basis. Ensure outsourcing passes a Net Public Impact Test, which examines as appropriate the financial, economic, social and administrative impact, including reputational risks, loss of capability and public accountability. 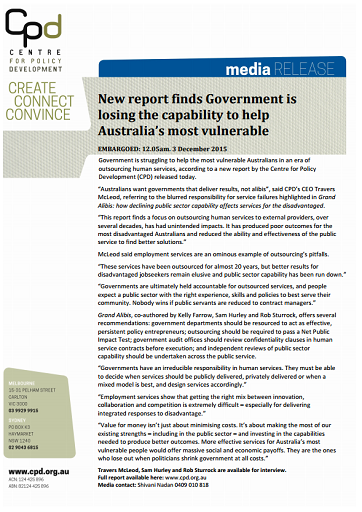 Improve the evidence base by ensuring that the forthcoming Productivity Commission review of human services considers public sector capability to act on disadvantage, and by empowering the the Australian National Audit Office and state counterparts to review confidentiality clauses in outsourcing contracts before execution. 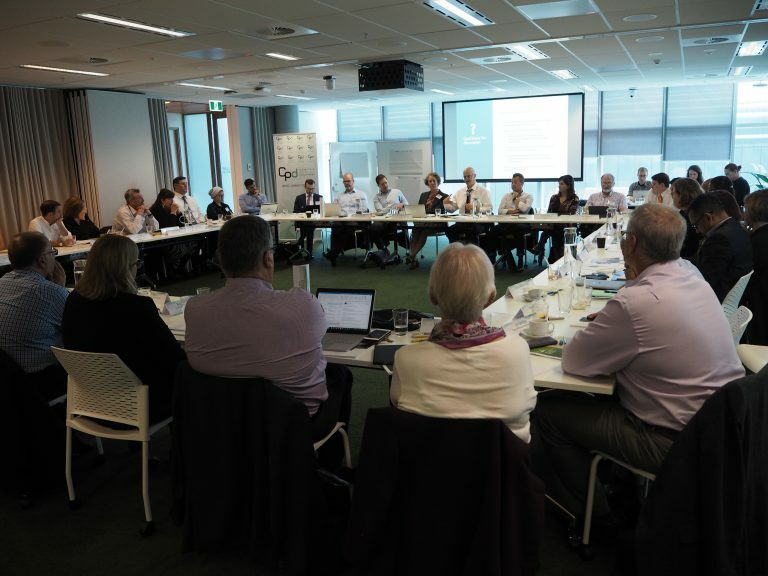 In March 2015, CPD hosted a high-level social service delivery roundtable to explore some of the more challenging aspects of designing and implementing services to assist vulnerable Australians. The Grand Alibis report draws heavily on invaluable and diverse viewpoints expressed at the roundtable, and on subsequent consultations with many roundtable participants and other experts and stakeholders. Click below for an illustration of how Australia’s employment services system has evolved since the early 1990s. I have just read your article on Inside Story on JobActive. 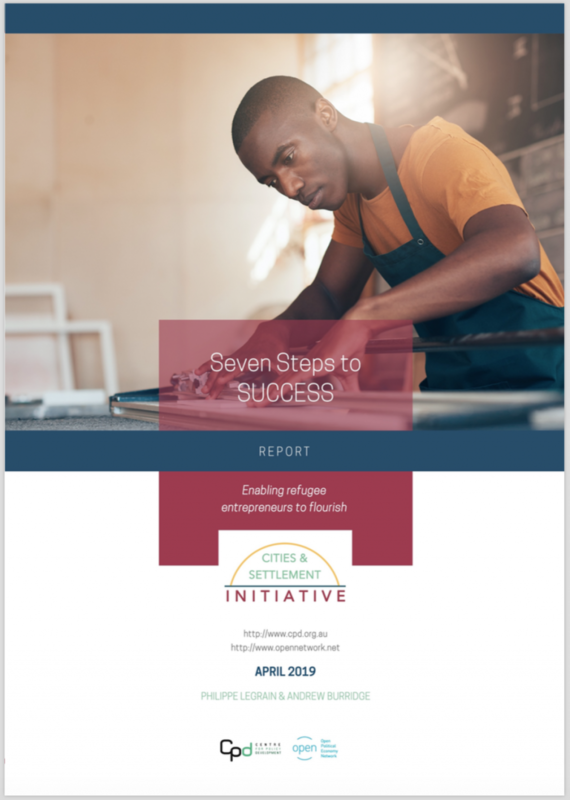 As a volunteer I have been helping refugees, other migrants and some asylum seekers with resumes, cover letters, interview skills and job search for a number of years. None of the considerable number of people I have helped have ever got a job through JobActive or one of its predecessors., although quite a number have obtained employment after I have helped them. From what they have told me, the JobActive role is to act as a policeman for Centrelink. Its main role seems to be monitoring job seekers’ attempts to find workers jobseekers have to report and provide evidence of their 25 job applications to JobActive in order to keep their Centrelink payment. There appears to be little in the way of assistance with resumes, cover letters, interview skills or job search. At the very least they should be monitoring vacancies and actively assisting jobseekers to apply for suitable work. In an ideal world they would have partnerships with employers in their area and play an advocacy role. At the moment, they seem to be a waste of large amounts of public money.